United in their forbidden love, Joy and Rurik fight a small army of Neurian flesh-eaters who have come to kill Rurik for abandoning their fading clan. The Lost Girl begins with Joy leaving an orphanage and her best friend, Sarah, to seek out a life she has dreamed of in Nantucket. She starts hitchhiking toward her goal. She ends up stranded in the woods where she encounters Rurik, a Neuri shapeshifter. I really enjoyed The Lost Girl. Each scene conveyed a wealth of information either through dialog, artwork, or both. There's a bit of romance but that is not the main focus of the story. In some ways I felt this was more Rurik's story than Joy's. We get a wealth of information about Rurik's background and people - what has happened to them, why he left them, the bigotry against and by the Neuri. Joy is more of a clean slate. She's just starting her 'new' life. For a brief time their lives intersect. We see Joy's strength and character though I can't help but think that Joy is a bit reckless as an 18 year old tasting freedom for the first time might be. Even she recognizes that hitch hiking may not be the best thing to do. Visually, The Lost Girl is stunning. Rob Ten Pas' artwork is beautiful. The story moves at a very fast pace without missing a beat. The Lost Girl is a tale of girl meets Neuri, girl and Neuri fight a common foe, and girl and Neuri move on. It is filed with action, some gore, and a very interesting backstory about Rurik and his people. Bottom Line: The Lost Girl is a compelling story that not only delights visually but is also entertaining and thought-provoking. I give The Lost Girl 4 1/2 Qwills. TQ: Hi, Michael. Welcome to The Qwillery. TQ: What inspired you to write The Lost Girl? Michael: I’d been kicking around the concept for about a year and had the main characters, plot, and general story elements written in my head but hadn’t come up with a fresh enough angle to motivate me to actually write it start-to-finish until I saw a documentary on History Channel about vampires and werewolves. In it they referenced a 5th Century BC historical account by Herodotus, the Greek “Father of History,” about a clan from southern Russia called Neurians who transformed into beasts. What fascinated me most is that this brief account is from history not mythology and that gave me what I needed to start actually writing. I know that Herodotus himself debunked this but that’s not the point; the point was taking that seed, supposing it were true, and applying the simple premise, “Where would the Neuri be now, present day?” as a springboard to tell a story that comes readymade with thousands of years of history and backstory to reference and reimagine. TQ: What was the most challenging thing for you about writing/creating The Lost Girl? Michael: Making the characters believable within the reality I was creating was the usual challenge. “What would real people do in this situation if it were really happening?” is how I generally approach horror, sci-fi, and fantasy, all genre elements here. That may seem obvious but the reason why something like The Walking Dead was as popular as it was before the TV show is because it did just that. Kirkman took a tired formula and the twist – in addition to just being a heck of a good writer – was populating that world with characters who responded to fantastic situations in ways that you or I might, too. And he took his time with letting it all unfold in “real time” so we became invested in their story, not just the situation, which served as a backdrop for character motivations. Too many writers get caught up in “the gizmo,” the plot, the world, or whatever that one unique concept is, and let the characters be slaves to that when the best writing is almost always the other way 'round. That kind of storytelling was my goal with The Lost Girl and with Joy it pretty much wrote itself. The complexities of the motivations with Rurik and Stas as well as the relationships and politics within the Neuri clan presented the biggest writing challenges because, for the Neurians, that fantastic reality is their everyday, normal reality. It’s not as tough to write the “fish out of water” that Joy becomes because it’s easy to drawn on your own experiences for that. The real work is creating characters completely apart from your life experience yet finding ways to imbue them with universally identifiable cores of humanity or, in this case, lost humanity. 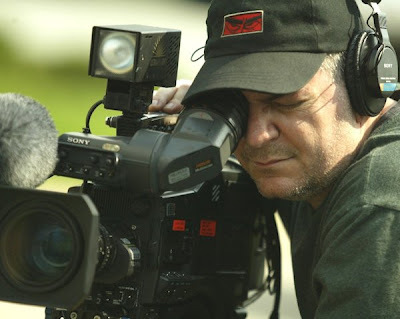 TQ: In addition to writing The Lost Girl (among other works) you're a filmmaker. Does writing/creating a work like The Lost Girl share any similarities with making a film? Michael: Probably more similarities than differences. How I conceive stories can come from pretty much anywhere but the writing process is always the same. Some take longer than others to complete but there’s no escaping that you have to sit down and write. The process from it being in your head and then putting it onto the page is one step of filtering or interpretation, the actualizing of the concepts into the written word. Directing a film, shot by shot, sequence by sequence, is a similar process of filtering and interpretation to actualization that continues to the editing and scoring process. But you’re not doing it alone like you usually do when writing; it’s with a team of collaborators who bring all their skills and talents to the table. Writing a comic book script definitely has its medium-centric demands, primarily that the actualization process requires a lot more precision and details in the writing itself since, using the filmmaker analogy, you’re essentially writing your direction to the illustrator who is your actors, cinematographer, production designer, you name it. And Rob Ten Pas did it all! TQ: Are there any plans for Joy and Rurik to return in another graphic novel? Michael: Those who have already read it know it is visually bracketed with the first visual being the same as its last, which are both new beginnings for Joy. So it was always intended to be a self-contained story. A few people have commented that it sets up a sequel but The Lost Girl is the story of Joy and Rurik. Yes, the stories of those left alive continue after the last page and some of the threads are left unresolved but only insofar as plot. Emotionally, we know where everyone is at the end and how they’ve been transformed. To me, the stories one can imagine from there are probably better than what I’d write but if I were to write a sequel it would be about Rurik since, for the story to truly work, there’s no way Joy and Rurik can ever see each other again. That story becomes her personal mythology and the fabric of her life thereafter. The fairy tale qualities of the story are obvious and intentional so, to me, it’d be like a sequel to Little Red Riding Hood. Does it even matter what comes next? No, not really. But if I’m lucky enough for the response to this to be so great that the market demands a sequel I’m sure I’ll change my tune but only if Rob Ten Pas does it with me. Rob is amazingly talented. It was a privilege to work with him and I hope to work with him again on something. Michael: I have a script that I want to adapt into a comic book series called Awful Bliss. It’s a reimagining of the pod people, sci-fi genre that owes as much to Red Dawn as it does to Invasion of the Body Snatchers. I’m trying to convince Arcana to publish it but they’ve got a lot on their roster so the timing may not be right. We’ll see. For movies, I wrote the screenplay for the adaptation of Jesus Hates Zombies, Stephen Lindsay’s comic book series. If everything goes according to plan, I’ll be one of the producers and Eric Balfour of Haven fame will direct. I’ve also got a serial killer script that I wrote, Meanest Man in the World, in development too and that may come together with me directing sooner rather than later. Fingers crossed. Michael: Thank you, Sally. It was my pleasure. Hosting the American premiere of Michael Mongillo’s third feature film, the docufiction satire, “Being Michael Madsen,” Starz Denver Film Festival dubbed the Connecticut native, “Indie filmmaker on-the-rise.” But independent movie fans were already tuned-in to his work from his debut feature, “The Wind,” a dreamy morality tale about misconceptions and murder. This Super 16mm horror-thriller was a film fest favorite, winning two Best Picture awards and receiving five nominations, including Best Screenplay and Best Director. Praise by maverick movie director Ralph Bakshi (“The Lord of the Rings”) and a full-page article in horror genre trendsetter Fangoria Magazine prior to its commercial release helped secure the film’s international distribution. Mongillo’s follow-up feature, “Welcome to Earth,” ponders love and friendship during the global countdown to alien visitation. Shot in just six days on MiniDV, this no-budget sci-fi dramedy was a conscious departure for Mongillo. Unlike the controlled visual grammar and lighting of “The Wind,” Mongillo embraced a handheld documentary approach, directing anywhere between two and four simultaneously shooting camcorders while employing a ‘found light’ aesthetic. “Welcome to Earth” went on to win a Remi Award at WorldFest Houston and was selected as the Closing Night Feature at the New England Film Festival. “Being Michael Madsen,” Mongillo’s third feature as writer, producer, and director, was a fusion of the techniques of his two previous pictures, balancing documentary-style with studio precision; yet, again, he utilized a genre backdrop (this time, mockumentary) as a vehicle to explore two common themes in his work, friendship and betrayal. Shot on HDCam in Hollywood and Connecticut, this deconstruction of celebrity and mass media stars Michael Madsen (“Reservoir Dogs”), Virginia Madsen (“Sideways”), Daryl Hannah (“Blade Runner”), David Carradine (“Kill Bill”), Harry Dean Stanton (“Paris, Texas”), Lacey Chabert (“Mean Girls”), Paige Davis (“Trading Spaces”), and Debbie Rochon (“The Toxic Avenger”). In addition to screening at two international top-ten film festivals, “Being Michael Madsen” was honored with the Audience Award at the Faux Film Festival and won Mongillo the Best Director award at the Mockumentary Film Festival. Mongillo was also a founding member of the Rock band, 50 Feet Tall, a mainstay of NYC’s original music scene in the '90s. Band highlights include a release on Deep Elm Records, Top 30 college radio airplay, and regularly sharing the bill with the likes of the Smithereens and Nada Surf. While in 50 Feet Tall, Mongillo created and wrote the super-spy turns superhero comic book mini-series, “The Philistine,” which had earned a loyal cult following even before it was featured in Kevin Smith’s “Chasing Amy.” “The Philistine” remains in continuous print as a top-shelf graphic novel. Mongillo has also written film, comic book, and music commentary for The Hartford Planet, Strictly Independent, and America Online’s Rogue, respectively. Mongillo is currently in pre-production on the horror-comedy road movie, “Jesus Hates Zombies,” based on the sleeper hit comic book series and graphic novels. Mongillo’s screenplay adaptation has attracted A-list talent and major distribution; official attachments will be announced by late-2012 with Mongillo producing through his company, Mean Time Productions. “Jesus Hates Zombies” will be the feature directorial debut of film and television star, Eric Balfour (“Skyline”). Mongillo is also developing the original serial killer thriller, “Meanest Man in the World,” which will be his next feature as writer/director. Also in early-2012, Mongillo’s new graphic novel, the action-fantasy-romance, “The Lost Girl,” was released by Arcana Comics, the publishing arm of Arcana Studios. What an interesting interview. I would love to have a look at "The Lost Girl" in a bookstore like in "the old days." It's so hard to find a decent bookstore anymore. I can tell it's awesome but there's just something traditional about flipping through the pages of a graphic novel, getting all excited and then buying it, rather than just ordering online. I may have to give in. Good luck with the release.